Over the last few weeks, many bloggers have been very supportive of my book , Toddlers: An Instruction Manual so I wanted to make a point of saying thank you. First of all, I’m very grateful to those who have hosted guest posts featuring extracts from the book. Stars of Channel 4’s 15 Kids and Counting Larger Family Life featured a post on how to avoid toddler meltdowns. New Mummy’s Tips featured one of my favourite bits from the book – parents’ true confessions about their child’s worst tantrum, whilst over at Domestic Goddesque I wrote about what to do when your child has a tantrum in public. We were talking poo over at Mum Friendly – and in particular, what to do if your child won’t poo in the potty. Mum Friendly also invited me back for a bit of a rant about why parents shouldn’t aim to be their child’s best friend. Mum Down South featured the section on how toddlers react to stress at home. At I Heart Motherhood, we were looking at fussy eating and what to do if your child won’t eat. US-based blogger Ellie at Mommy Masters is expecting her third child, so we looked at introducing your toddler to a new baby. Other bloggers have also been reviewing – thanks to Curly & Candid and Wisdom Begins in Wonder for buying the book and for saying some very kind words indeed. And not forgetting some lovely posts from the bloggers featured in the book, which I rounded up here. I love this post from contributor 12 Hours to Bedtime where she deals with a happy dilemma of being an anonymous blogger who wants to tell the world she’s in a book. This being a publication which aims to raise money for charity, there isn’t a huge marketing budget or oodles of review copies to throw around. I am very grateful to those who have written about it or allowed me to guest post . 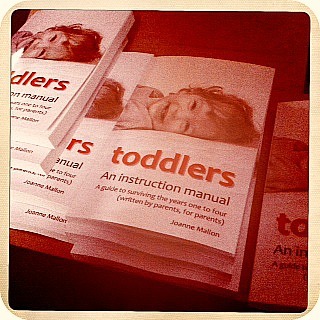 And if anybody else wants a toddler-related guest post give me a shout, there is LOTS to say on the subject. If you were incredibly stingy you could print out these posts, staple the pages together and create a mini toddler book for free. But come on, it’s for charity and the Kindle edition is only about £3. The book now has two five star reviews on Amazon and at one point reached the top 3 in its category. It’s now dropped down a bit from there but I’m not bitter much. Yes I realise that some people may be sick of hearing about it by now, but once you’ve all bought a copy, then I will stop, and in the meantime indulge me a bit of book book boookkkkk time.